Luca is a good dad. Also today is backwards day. – Pimp of the week this week goes to B.I.B.L.E. not only for the clever acronym but for the wonderful art and good writing. Take a look! – Another pimp/ shout out to my friend Mario, who has been doing his Wyliman comic for several years now! Notable because he has a real site for the comic after all these years on dA. – An interview! With some bg info on the Meek, you can read it here at Flashes in the Dark. Thank you! Luca acts like an emperor all the time, which obvs gets his wife annoyed. Nobody else is able to do anything about it though, haha. That’s dictators for you, I guess. Wow, I can tell Luca is an emperor’s emperor- harsh on his men and stingy with his money. I <3 Suda's face in panel 2. Going to check out pimp'd sites now. 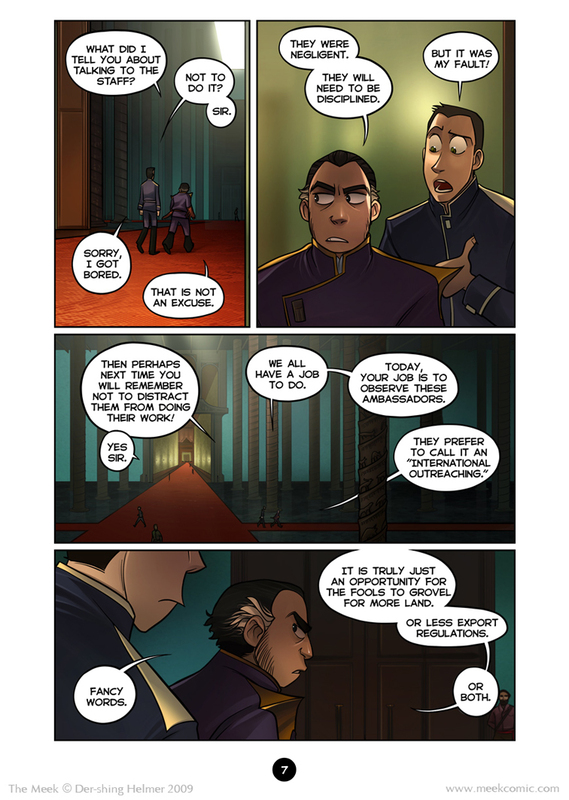 I figured that’s what happened; it seems alot of webcomic artists are having to slow down updates to compensate for their workloads.Anyway,great page! And Luca is a great dad and role model *sarcasm*.Palace looks cool though,too dark or not.I did have a comic I was going to pimp,but I forgot what it was xD.Also seems Sean from Tomcat LTD is plugging Mario Gonzalez about having a website up for his comic.You guys know the same people O: ! Ooohh! Can’t wait to see what’s behind that door! I really like the big hall, I don’t think it’s to dark at all. It gives that ‘you’re just a small bug’-feeling that goes with such places xD Nice one! I really admire how well you pull of this pompous palace architecture. It gives a nice atmosphere with the huge size difference between the building and the itty bitty people. I love the Pasori culture. Can’t wait to hear more about them. Wait, what are these ‘incentive’ things? Where does one access them? I am confused. A. The architecture continues to be amazing. And my dad’s an architect, so I’ve… seen a lot of it? I dunno where I was going with that. B. Poor Mustachio, gettin’ in trouble with the Emperor. I guess that’s what he gets for gossiping like a schoolgirl, but I still feel bad for him. C. I love how cranky Luca is. Like, I thought he was cranky at the beginning of the chapter, but I see now that that was laid back for him. How can a short, cranky, greying man be so attractive? I don’t get how you did that. But you did, and I’m glad. D. Suda is cute, but he’s no Luca. Just…saying, I guess. Maybe he’ll grow into it. See that long vote button under the comic? If you vote once a day, you will see the image that I post as the incentive! c. Yeah, I started out with him being verrry laid back. It’ll be more evident in later chapters that he was actually being sort of easygoing. Oh, I’ve voted plenty of times, but I’ve never seen any incentive thingies. At least I think I’ve voted. My computer’s kinda weird sometimes. Ah well. Maybe try a different browser? I use Mozilla… usually after you vote successfully it says “Thanks” or something like that and shows the picture of the day. Thanks. I don’t like how I handle atmosphere, I am not getting the depth I want with this style of coloring :/ I’m sure I’ll figure it out on page 43 and have to go back and correct everything, haha! Maybe! But he also knows that Suda is a nice guy and will not get his friends in trouble/distract the staff again. Its a tad manipulative. Well, you’ll see the source of pissiness in a page or two XD He has a good reason. I loved reading that interview; you’re so intelligent and thoughtful and that is one of the many reasons why I love your work. I saw the lines for those backgrounds and they are just wonderful, I actually picked up a prespective tip from the third panel. Very nicely done. So, I just got done reading that interview. … I had no idea you were male. .w. And I’m quite entranced by the face shading in panel two. As for the colors… They’re certainly very tones, but I think the major darkness comes from the vignetting. Oops, haha. You’re not supposed to be looking so hard XD Its actually a musk ox. Well, its in perspective at least… all hand drawn, no software used. I may experiment in sketches later on, but I have so little time for learning new things that I am sticking to photoshop and hand drawn perspective for the time being. You may have a look at google sketch up, its even easier than great Blender. Seriously it is easy as hell and has a vast online growing lybrari of made objects. I like them :> And you did a nice job with the page. Also, I always thought you were a girl, but the Interview says otherwise. I love the detail in the blown up voting incentive! Good way to guilt your son into completely not relating to the help thar Luca haha. That room is absolutely amazing. I want to see what the palace looks like on the outside. us girls do love men in uniform! The lighting looks perfect to me. Especially the glowy roof opening. Since it’s morning the sun wouldn’t be shining down in there yet anyway. aaaaaaaaah I’m just adoring the color of suda’s suity thingy. The third panel is breathtaking. I only ever got that feeling from actual buildings, not from pictures. I like how you threaded that speech bubble around the collum, it’s a nice effect. English (??) is not his first language! You’ll see a lot more grammar mistakes coming out of his mouth, so don’t freak out XD They are intentional.